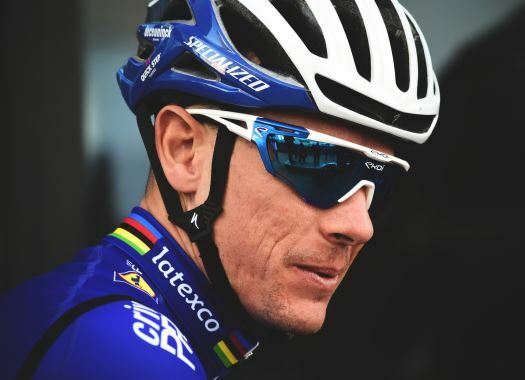 Deceuninck-Quick-Step's Philippe Gilbert has taken the victory of Paris-Roubaix. The Belgian was faster at the finish line in the Velodrome of Roubaix, beating his escape companion Nils Politt. The 'Hell of the North' was 257 kilometres long between Compiegne, in the outskirts of Paris, and the Velodrome of Roubaix over a route that included 28 cobbled sectors. The first part of the race witnessed several attacks by riders like Jurgen Roelandts, Casper Pedersen, Mads Wurtz Schmidt, Andre Greipel, Silvan Dillier and Philippe Gilbert, among others, but none could stay in front for long. Several teams like Bahrain-Merida and Trek-Segafredo tried to take advantage of the wind and set a high pace at the front of the peloton, which caused some cuts in the pack but eventually it all came back together. CCC Team positioned Greg Van Avermaet well ahead of the Trouee d'Arenberg and he entered the stretch at the front of the peloton, while Jumbo-Visma's Wout van Aert was left behind with a mechanical problem. The Belgian took Pascal Eenkhoorn's bike to finish that cobbled sector and then changed to his own, but metres later crashed in a curve and had to start chasing the main group again. AG2R La Mondiale's Stijn Vandenbergh took a small lead at the end of Arenberg and kept it for a moment, but was eventually caught by the reduced pack. With 67 kilometres to go, Nils Politt (Katusha-Alpecin), Philippe Gilbert (Deceuninck-Quick-Step) and Rüdiger Selig (Bora-hansgrohe) attacked and built a gap with the rest. At the 12th cobblestone section, Selig dropped from the front while a chase group was formed by riders like Peter Sagan, Van Aert, Ivan Garcia Cortina, Yves Lampaert and Christopher Laporte, among others. Moments later, Politt couldn't hold onto Gilbert's wheel any longer and the Belgian was left in front by himself. With 48 kilometres to go, the chasers caught Gilbert at the start of the 11th sector. As the kilometres went by only Van Aert, Politt, Sep Vanmarcke, Gilbert and Sagan remained. At 20 kilometres from the end, Gilbert launched a new attack and was followed by Politt and Sagan, while the others were left struggling behind and Van Aert was soon dropped from the second group as well. Three kilometres later, Vanmarcke and Lampaert returned to the front of the race. In the fourth cobblestone sector, Gilbert once again attacked and Sagan was the only rider that could follow his wheel. Moments later, they were caught by the other two again and almost right away Politt changed the pace and took Gilbert with him while the others were suffering in the back. The duo arrived together to the Velodrome of Roubaix, where after some tense moments Gilbert was first to launch the final sprint, proving to have the stronger legs to cross the finish line in the first position. Lampaert was third on the race's podium. This is the fifth victory of the former World Champion in a monument race. He has won Il Lombardia in 2009 and 2010, Liege-Bastogne-Liege in 2011 and the Tour of Flanders in 2017.